The Jewish Festival of Lights lasts for 8 days and is loved by both kids and adults alike. Find out more about dates for Hanukkah, learn about the traditions and the celebrations! Also commonly known as the Festival of Lights, Hanukkah is very important to many people around the world. It is a traditional Jewish holiday with deep religious significance within the community. It is a holiday that brings families and friends together, typically in evening celebrations. The name of the holiday is actually a Hebrew word, and it isn’t too easy to translate. That is why you will see spelling variations from time to time. Hanukkah and Chanukah are the ones you will notice the most often. When is Hanukkah 2018? – Hanukkah will start on the evening of Sunday, December 2nd and last until the evening of Monday, December 10th. When is Hanukkah 2019? – Hanukkah will begin on the evening of Sunday, December 22nd and will end on the evening of Monday, December 30th. How many days are there in Hanukkah? - Hanukkah always occurs over eight days and nights. Many families observing Hanukkah will include a menorah in their nightly celebration. A menorah is an important part of the celebration because it holds the eight candles that are lit one-by-one each night of Hanukkah. Many families have special menorahs that have been passed down from generation to generation. You might notice that the menorah has nine holders for candles, but Hanukkah only lasts for eight nights. The additional holder, that is usually higher or set apart on the menorah from the others, is for the Shamash candle that is used to light all of the other candles. Why is the Hanukkah candle so important? Hanukkah is a festival of lights, so clearly lights are going to be especially important. To learn where the festival originated, we need to look back in history to when the Maccabees reclaimed the Temple. They found just enough oil left in the Temple for one lantern to be lit for one day. They lit the lantern, and when it didn't extinguish after the first day, the second day, and it kept going even longer, they celebrated it as a miracle. In fact, the oil lasted for a surprising eight days, and the light it created was a very important symbol in the Jewish faith. In modern times, candles on the menorah represent the days that the lantern in the Temple stayed lit. Put up Hanukkah decorations – Traditionally, Hanukkah decorations are lights on a menorah (we’ll share more about that later). Hanukkah is often celebrated with blue and white (or silver) decorations and the Star of David. Since it’s a festival about light, many households decorate with strings of lights around the house as well. Spin Dreidels – You may have heard the dreidel song before, but what exactly is a dreidel? It's a small toy that spins like a top. Dreidels have four sides, and each side has a Hebrew letter written on it. During Hanukkah, children (and adults too) spin the dreidel to try and win small treats like Hanukkah gelt, which can be real money or chocolate coins. Celebrate with pop culture – From Saturday Night Live alum Jon Lovitz’s Hanukkah Harry character to the Adam Sandler movie Eight Crazy Nights, Hanukkah takes center stage in many movies, television shows, and songs. Create traditions by finding your new favorite holiday film! Host a dinner – As Hanukkah is celebrated in the evening, it is popular to host a dinner on one (or several) of the nights. Since it lasts for eight nights, you have eight chances to get together with family and friends to celebrate. If you have a big family, you can host a Hanukkah potluck where everyone can bring their own dish. The important thing is that everyone is together. Create memories – Don’t want to spend a lot this season? Why not create a family project? Making a craft like holiday decorations on the first night will be a fun time for your whole family and provide you with beautiful decorations for years to come. Which Hanukkah food do most people eat? Hanukkah is a wonderful time for food. Don’t fill up on Hanukkah gelt, there's much more delicious food in store! One especially popular food is potato latkes, which are more commonly known as potato pancakes. Paired with applesauce or sour cream, this crispy potato dish is a family favorite. Many people also bake or purchase Challah bread for their celebration. Challah bread is eaten on many Jewish holidays or occasions like the Sabbath and Hanukkah. Another popular Hanukkah food is kugel, which is a casserole that is usually egg noodle based. What are traditional Hanukkah gifts? Give Hanukkah Gelt – As mentioned when we were talking about the dreidel, Hanukkah gelt can be money or chocolate coins. These make great gifts and are very popular to give during Hanukkah. Send a card – If you have family and loved ones celebrating in different cities, why not send Hanukkah ecards? This simple gesture shows them just how much you care. Give someone a reason to enjoy opening their mailbox or inbox this holiday season. Get a family gift – Getting something the entire family can enjoy will make this season even better. Fun family gifts like trivia games or a meal kit subscription ensure that the togetherness won’t end just because Hanukkah is over. Give back – Gift giving means spreading joy. By making a donation in a friend’s name, you give them something special while also helping a charity in need. Find out what charities your friend or family member cares about most, and support that cause. Every bit helps! 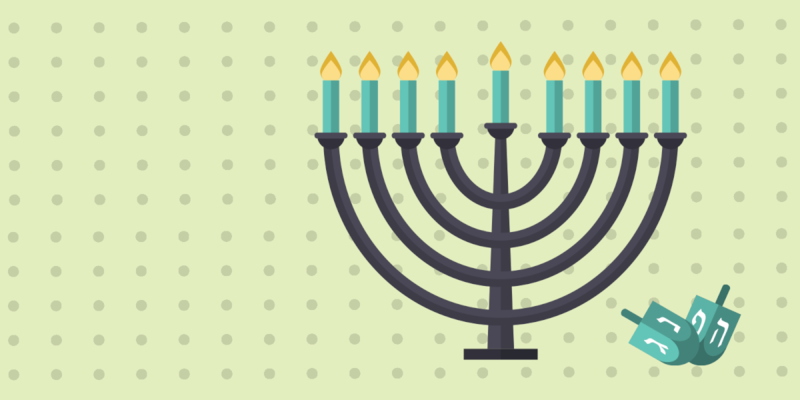 Which Hanukkah song is the most popular? Another great part of Hanukkah is the songs you get to sing. One of the more popular songs is The Dreidel Song, which you sing while playing the dreidel game. Another popular Hanukkah song is Maoz Tzur. This song is actually a Hebrew poem that is sung once the lights are lit, and the celebration begins.